The Taste the Cracklin name represents the highest in quality hog roast catering throughout Knaresborough and beyond. Distinct from other hog roasters is our never-relenting professionalism and knack for making hog roast meat jammed full of flavour and crackling with a potent crunch. And like all good caterers we make ourselves available in the holiday seasons so that you can get the #1 hog roast in Knaresborough even for the upcoming Christmas and New Years events. The extravagant but wholesome flavour of a spit pig is one of lives greatest pleasures, and when you combine a spit roast pig with an event, celebratory or otherwise, you’re onto a winning combination. Making hog roasts is not the beginning and end of why we’re chosen to cater at hundreds of events every year, our success boils down to more than that, it’s as much about how we make and serve our hog roast as it is the fact that we make them. The times we cater are exceptionally flexible, which is a big plus in the eyes of those who come to us, as one small example. The Taste the Cracklin chefs and waitresses are a dedicated lot and can often be found rising at the crack of dawn to head out to an event and begin cooking and preparing for an early morning hog roast, likewise, we’ll hog roast into the late hours and early morning for party events quite regularly. Spit roasts and events go together like bread and butter, that’s always been the case, you can look at the history of spit roasting, go as far back as you like, you’ll find that spit roasts have been practically indistinguishable from large gatherings and celebratory events. Hog roasts have transcended class and country lines for hundreds of years, it seems everybody agreed when they couldn’t agree on much else that a spit roast was the staple part of a real feast. That’s why all throughout Europe and the Americas you’ll find a history of hog roasting as rich as a serving of crispy crackling. We’ve now moved away from a simple open fire and a stick, today hog roasting is done with top of the line works of engineering brilliance. We now use hugely powerful machines, (which can cost in their thousands) to give your event the winning hog roast touch. With Taste the Cracklin machines, we can spit roast any meats for your event, we can even roast jacket potatoes and very often do that towards the end of the year, especially for bonfire night bookings. At times it’s almost like we’re the best of many different caterers rolled into one, because the contrast between what we can do is so great, it’s something that not many can do. There are caterers out there who cater for thousands of people, but they often shy away from small events for 20 people, and there are small caterers out there who cater small events but don’t have the skill and equipment to cater for thousands – and then there’s Taste the Cracklin, the hog roast company that does both best. With a supply of the finest lamb, beef, chicken, pig and turkey to our name we’ve made a huge splash in Knaresborough’s catering community. So many are left wanting to know how we do it, where do we find our chefs and produce, how did we design such stunningly immaculate machines? The truth of our unbreakable popularity is that it all comes down to nothing but good old fashioned hard work and dedication. We’re dedicated and passionate about our hog roasting and we work harder than the rest, that’s how we got to be the top tier hog roast caterers that we are, that’s what makes us a prime, if not THE prime candidate to come and cater for your event. For us, we believe that the hog roast desires can only be satisfied by using all of the best produce, cooking equipment, chefs and waiting staff! You get all of this experience and knowledge each and every time you hire Taste the Cracklin or a machine from us for a fixed period of time. Machine hire can be done on a daily, weekly or even monthly basis, giving you as long as you need and require to make use of our machines. 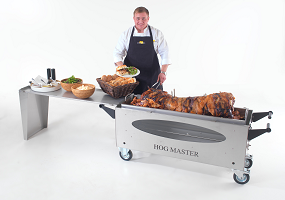 The ease-of-use of the hog roast machines is what makes our machines so sought after. It’s easy for us to say this, but our customers haven even commented that one of our hog roast machines is “easier than using a new microwave”. So don’t take our word for it, go ahead and give it a try and within minutes, you’ll be hog roasting like a pro with our hog roast hire safety assured machines.